American lawmakers, including House Minority Leader Nancy Pelosi, will greet Prime Minister Narendra Modi at the Silicon Valley reception. The Barack Obama administration has said the US relationship with India "will be one of the defining partnerships of the 21st century." In recognition of this shift in Indo-US relations since the change in Indian leadership 17 months ago, the Congressmen are lining up to greet Prime Minister Narendra Modi at the Community Reception to be held at SAP Center in San Jose on September 27. Several members of Congress are confirmed to be in attendance for the Prime Minister's address to a diverse crowd of 18,500 people. Included in this group are Ami Bera (D-California) and George Holding (R-North Carolina), the co-chairs of the Congressional Caucus on Indians and Indian Americans, a bipartisan group formed in 1993 that is an influential voice in championing strong ties between the US and India, as well as the growing Indian-American community in the U.S.
Several other members of the Caucus will be present, including Ed Royce (R-California), Loretta Sanchez (D-California), Eric Swalwell (D-California), Mike Honda (D-California), Tulsi Gabbard (D-Hawaii), Sheila Jackson Lee (D-Texas), Pete Sessions (R-Texas), and Jim McDermott (D-Washington). In addition, Jerry McNerney (D-California), John Garamendi (D-California) and Dana Rohrabacher (R-California) will join their fellow Congressmen in welcoming Prime Minister Modi. The senior most member of this Congressional group is House Minority Leader Nancy Pelosi (D-California). Pelosi has been a longstanding supporter of Prime Minister Modi and has personally focused her energies to promote Indo-US relations. In September 2014, she addressed a bipartisan delegation meeting with the prime minister. Congressman Eric Swalwell, who represents a large Indo-American constituency in the 15th Congressional district of California, released a video message in which he said that he is 'pleased to welcome Indian Prime Minister Modi to our home in the Bay Area'. Ed Royce, Chairman of the House Foreign Affairs Committee enthusiastically noted, "Prime Minister Modi's visit to Silicon Valley will bring the US and Indian tech sectors closer together, in large part because of the Indian-American community's outstanding achievements here. Prime Minister Modi has already done much to help grow our economic partnership, setting the stage for economic growth." Representative Tulsi Gabbard, a strong supporter of Prime Minister Modi, met him during his New York visit in September 2014 and also visited with him during a tour of India in January 2015. In reference to his second visit to the United States, she states "I'm looking forward to welcoming Prime Minister Modi... He'll be meeting with a variety of tech entrepreneurs and CEOs, seeing how we can further develop partnerships that will benefit both the Unites States' and India's economy." Though unable to attend the reception, Congresswoman Zoe Lofgren (D-California) posted a video message stating, "I am proud to welcome Prime Minister Modi to the United States and to my congressional district here in the heart of Silicon Valley. India and the Silicon Valley share the ideals of innovation and entrepreneurship. I am confident that during the Prime Minister's visit to California and during his meetings with Silicon Valley tech entrepreneurs, leaders, and CEOs, we can help build a stronger, profitable and more lasting relationship between our two nations." Representative Frank Pallone (D-New Jersey) also released a video statement welcoming the Prime Minister. He noted the growth in the US-India relationship over the past 20 years and potential for continued expansion of the partnership in many arenas including shared strategic and economic interests. Two prominent Senators joined their Congress counterparts in welcoming the Prime Minister to the United States. In a video message, Senator John McCain (R-Arizona), who was one of the first top officials to meet with Prime Minister Modi on his last visit to the US, outlined the vision he has for a Indo-US partnership. 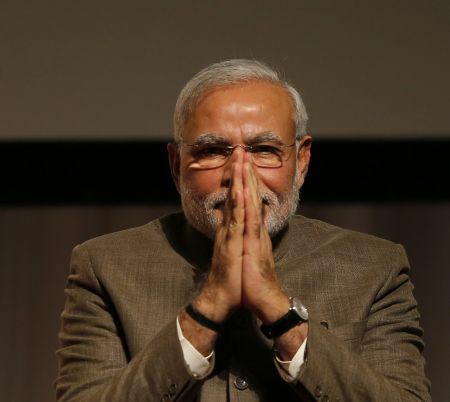 "The US wants Prime Minister Modi to succeed because we want India to succeed. I strongly believe that Prime Minister Modi's election last year represent an important opportunity between our two nations... Our nations must begin to think more ambitiously by how we can invest in each other and improve our capacity to work together on a whole range of issues from energy to trade and investment to defense among many other issues," said McCain. Senator Roger Wicker (R-Mississippi) also relayed a welcome message to Prime Minister Modi. In his message, he states, "It is my honour to welcome Prime Minister Modi to the United States. I wish I could be with you in Northern California... As a member of the Senate India Caucus, I am very familiar with the common bonds and shared interests between the United States and India, the largest free market democracy in the world." Numerous state, county and city officials will be in attendance to show their support for Prime Minister Modi and the Indian-American community.